It is a little known fact that you can seamlessly integrate the Magento and WordPress platforms. The use of Magento & WordPress integration for a website means that you will be able to reap the benefits of both platforms. If you are considering building an e-commerce website and care about SEO, scalability, performance and a good user experience, then moving forward with a WordPress and Magento integrated website is for you. 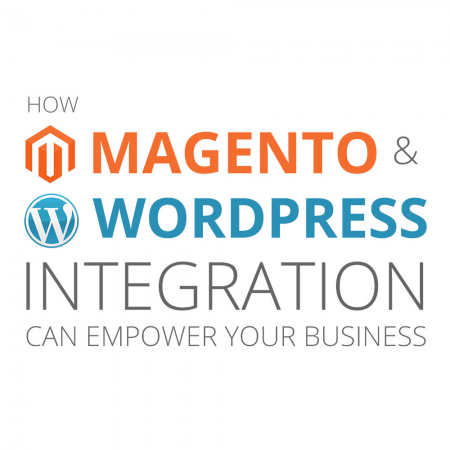 What is Magento & WordPress Integration? Integration of Magento and WordPress is the process of building a website that combines the robust inventory management and shopping cart capabilities of Magento with the powerful publication, blogging tools and simplistic UI of WordPress. Integrating both Magento and WordPress on a single website allows for sharing of tools that are normally specific to each platform. This integration also allows for seamless navigation between platforms. The user will be able to visit WordPress pages and navigate back to the products on Magento’s platform without having to navigate to a whole different website. WordPress is one of the best if not the best open source content management system and blogging platform. It comes with many different native and non-native features that you can easily take advantage of including SEO, article, and user management. WordPress also has an extremely user-friendly interface which allows for people of all levels of tech savviness to use this platform. Magento on the other hand, mirrors WordPress’s blogging capabilities in the form of a powerful shopping cart. The Magento platform takes care of everything a typical online business may need including product inventory, shipping information and a versatile cart. Generating blog feeds from WordPress on a Magento homepage. Displaying Magento’s theme and navigation items on a WordPress blog or CMS page, so while reading up on the latest news on your website, navigating to the products are only 1 click away. Using WordPress’s free plugins like Yoast SEO to drive more traffic to your website through search engine optimization of the blogs and CMS pages. Complete inventory/customer management through Magento’s default backend. One of the biggest benefits is versatility. Having multiple users managing your website can get messy and unintended situations may arise. As a website admin, minimizing access to your e-commerce platform is extremely important because, let’s face it, we as humans make mistakes and your e-commerce platform is where you want as least mistakes as possible. Using a Magento WordPress integrated site, you will be able to designate individuals to primarily manage the public-facing side of your company through news, blogs, and content pages all accessible on WordPress. You also will be able to designate individuals to manage the actual products and customers on the Magento platform. Another benefit will be the user experience that comes from the seamless integration. While on the WordPress website, they will be able to gain knowledge about your product or company and be able to navigate back to the Magento website to browse the products without having to worry about going to a whole new website. One of my personal favorite benefits is a little more technical. It is the allowing of sharing of elements and features typically available on the individual platforms. For example, having the integration of Magento and WordPress, will allow for the developer to use sidebars, menus, search bars, newsletters and more from Magento onto the WordPress side of the website. And the developer can also create load WordPress feeds onto Magento pages which is an easy way to keep consumers informed about anything you want them to know. An example of a Magento and WordPress integrated website that we have built is LBC Lighting. This is an e-commerce website that features lighting for various types of consumers. They use their blog not only to inform the community on recent news related to their business but also as a method to insert SEO-friendly keywords. This helps increase their visibility to people who are performing searches on popular search engines like Google, Yahoo, and Bing. Increasing their visibility on the web in turn increases their sales. To wrap things up, if you are in the market for a powerful e-commerce platform that also utilizes the tools from vigorous blogging platform, integrating WordPress and Magento is right for you. Contact us at Ready Artwork if you need more information about this type of integration and to see whether or not you should be taking advantage of these two free open source platforms.